For our first trip, we decided to explore the nearby city of Cuernavaca. This is a very popular weekend getaway, especially for wealthy Mexico City residents. We relaxed in our posh boutique hotel, explored the ruins of Xochicalco, and visited Cortes’ palace. Cuernavaca is only an hour or so south of Mexico City (but it usually takes more than an hour just to get out of Mexico City!) so it is a very popular weekend destination for D.F. residents. I had been working very long hours, so we decided to take two days to relax and refresh. Dan found this wonderful boutique hotel, La Casa Azul – where all the rooms are decorated in styles found in different parts of the country. Our room was from Olinea, which is known for its beautiful lacquered wood work. On Saturday, we drove to the ruins of Xochicalco. The drive itself was amazing. The countryside around Cuernavaca is extremely lush and almost tropical. This was also our first experience driving around small town Mexico – culture shock! People have stands for all kinds of food on the side of the road: freshly made ice cream, watermelon, tacos and barbacoa. In the middle of the freeway, people have set up stands with towers of roses piled high – and when traffic appears, vendors walk the lanes of the freeway selling anything from cookies to phone cards to bubble makers! The ruins themselves were really interesting. It was hard to tell how much was original v. reconstruction – but the setting completely made up for that. The hilltop ruin, which dates from ~700 A.D., was once a city populated by at least 10,000 people. The most famous sight here is the Piramide de Quetzalcoatl (Pyramid of the Plumed Serpent), which is marked by intricate geometric patterns and stone reliefs of men and serpents. Back in Cuernavaca, we explored the town and enjoyed watching all the families spending their afternoon in the main square. We visited the Catedral de Cuernavaca, the Jardin Borda, and the Jardin Juares. Our favorite sight was certainly the Palacio de Cortes, where the conquistador lived in the 1500s. The highlight of the palace are the Diego Rivera murals on the second floor, tracing the history of Cuernavaca from the Spanish invasion to the present. We enjoyed some great food over this weekend! Cuernavaca has some great restaurants – and other amazing hotels. See below for the details on the places we discovered. 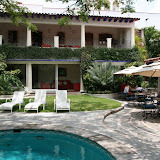 -Beautiful new boutique hotel in the heart of Cuernavaca. Rooms are decorated in styles reflective of different parts of the region. Two nice pools and quiet ambiance make it a perfect place to relax. -This gourmet Mexican restaurant is in a beautifully restored colonial building across from the Palacio de Cortez. Sophisticated and innovative cuisine. We had the mango and tequila soup, duck, fillet hidalgo (breaded and stuffed with Serrano ham and manchego cheese) and crepes con cajeta. -Cuernavaca’s most renowned luxury lodging (part of Relaix & Chateaux) and a popular weekend dining spot for affluent Mexico City residents (a friend just suggested we join them here for Sunday brunch). We did not stay here—but it looked like it’d be a great place to get away from the rush of things. We did enjoy a wonderful dinner here – it was so good that we came back the next day for brunch!